While traditionally lehengas were mainly adorned by the brides in North India, it’s not the case anymore. Lehengas are practically everywhere – and also not just restricted to the bride. Well, while the bridal couture is definitely the frontrunner, it does not just stop there. Thanks to our fashion designers, both old and new, the bar of innovation and design in ethnic wear has been raised exponentially. From cape sleeves to jacket cholis, halter necks to strapless blouses, illusion necklines to ponchos – there’s so much happening – which means, more options for us. Even though it’s a great thing, sometimes it can be overwhelming to narrow down your options and understand what suits your personality. Andyes, you guessed it right, I’m going to help you with just that today. 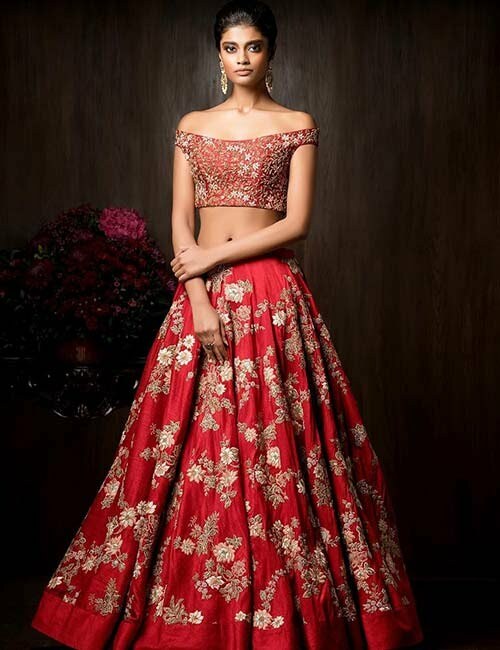 We present to you the best of lehenga blouse designs with a carefully curated catalog that has the best from the industry right now. I’m ready, so if you are, let’s check them out. 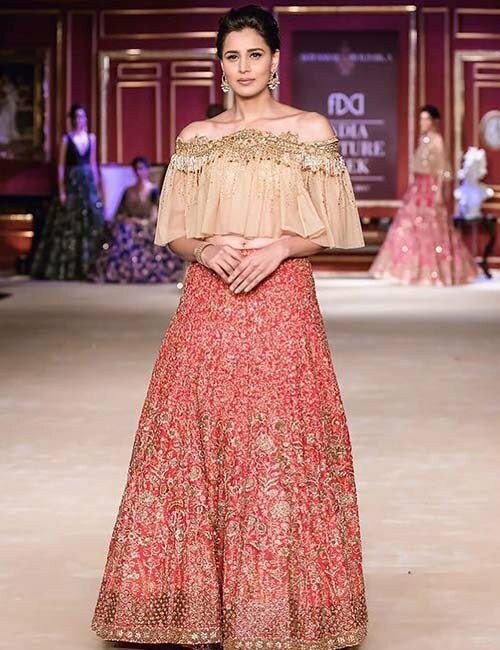 While brocade Banarasi sarees have made a major comeback, thanks to designers like Gaurang Shah and Sabyasachi, brocade dupattas and lehengas come a close second. Give this whimsical full blown brocade lehenga a shot. It has a deep plunged V neckline, which is very uncommon. Go with a tulle dupatta with sequin and patchwork embroidery to add a zing to the outfit. You can tie it up like a half saree if you are not comfortable with the broad neck. 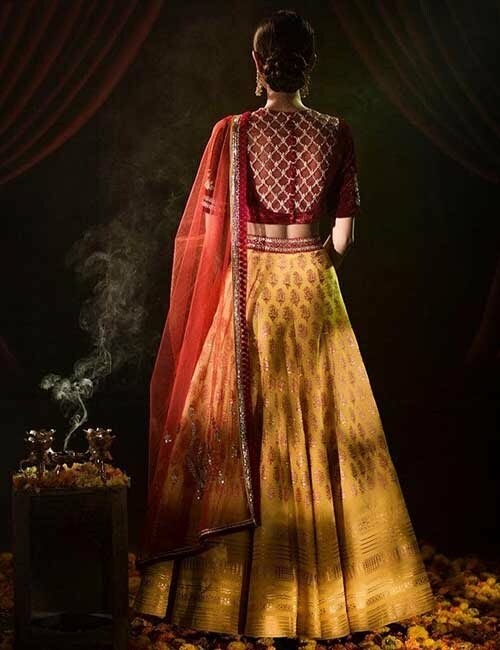 A bespoke blouse in golden color for a red colored lehenga is something no one can take their eyes off from, which makes it perfect for weddings. The heavy golden embroidery with a tinge of red in the backdrop looks awesome. The cape sleeves of this blouse are so unique. Off-shoulders have taken over both the traditional and contemporary clotheslines. From one piece dresses to salwarsuits, blouses to T-shirts, they are everywhere. While the lehenga is loaded with golden beaded embroidery, staying true to tradition, the blouse is balancing it out. It has a plain contemporary off-shoulder design and embroidery that is just enough to pop it all out. You can opt-out of a dupatta or go with a golden tulle one. Rose gold is one shade that came, conquered, and now, refuses to leave. But, we can’t complain because it opened up new avenues to explore for both customers and designers. While that’s that, here’s a blouse you cannot say no to. We have all seen a lion’s share of full sleeve designs, but, here’s a blouse that you cannot help but say ‘one more’ to. The floral petal sleeves will be the showstopper, and so will you! It is a preconceived notion and a very wrong one that the urban Indian woman does not indulge in traditional clothing and chooses western over Indian attire. 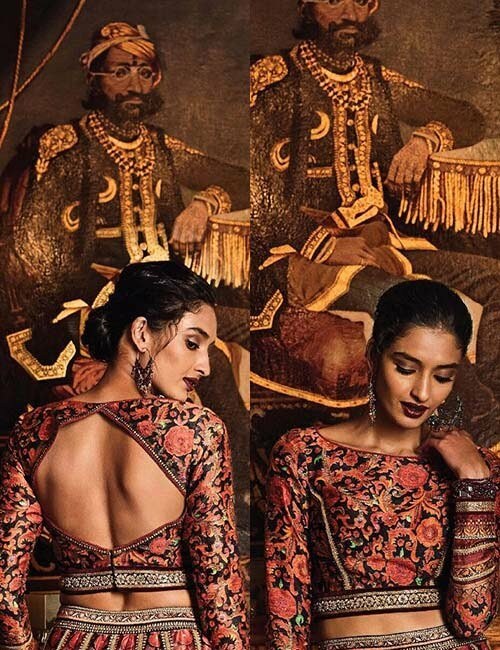 From luxury couture labels to local boutiques, the demand for ethnic wear is at an all-time high. We have designers tapping into our needs with designs that match the modern aesthetic without compromising on the traditional elements. 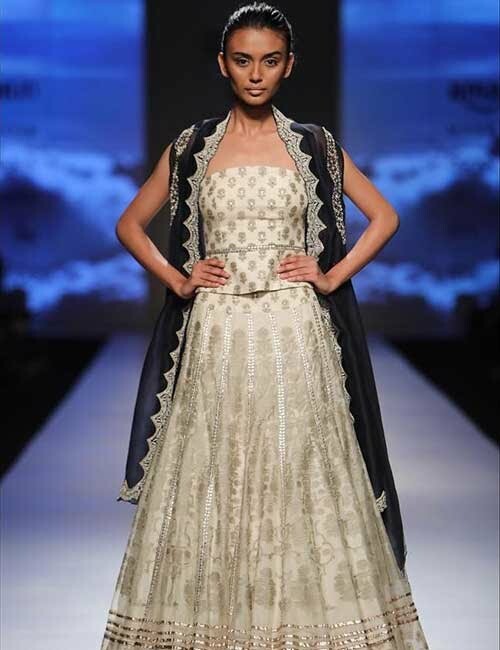 This is one such piece –a short crop top choli with svelte sleeves that perfectly complements the lehenga. 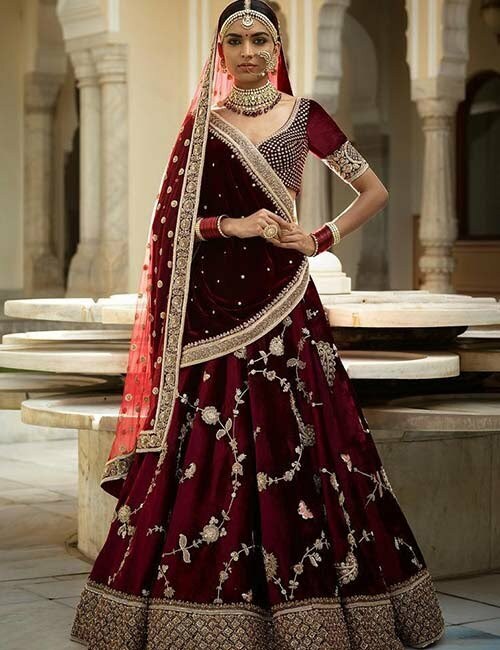 Are you are looking for a lehenga for your sangeet party? Say no more. This one hits all the traditional notes that make an outfit a bridal outfit. But, if you look at the bodice of the blouse, the deep broad front neck makes this attire a part of the contemporary segment too. You can continue the pattern to the back to complete the blouse. You could also use this with a saree or wear it with other lehengas. A soothing pastel lehenga for the pretty bride for a party before the wedding or for anyone who prefers subdued colors.The off-shoulder neckline is taking the blouse to the next level. The minimalistic floral work on the skirt adds to the classiness. Move away from the regular reds, pinks, and golds for the lehenga and give this dreamy silver lehenga a shot. The full sleeves sheer blouse with feather and glass sequin work marries Indian traditions with modern cuts. A jaw-dropping til embroidery blouse that is minimal and magnificent, and at the same time proves that the devil is in the details. Colors like crimson red, gold, orange, etc. 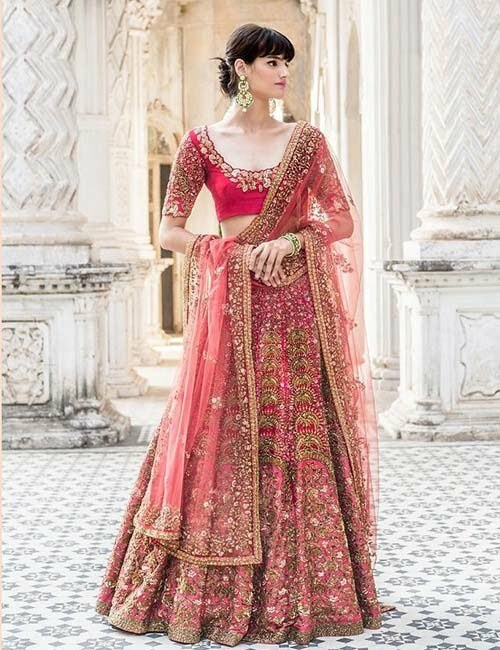 make the already gorgeous lehenga super gorgeous,and ensure all heads turn in the right direction. The gold paneled blouse is couture in the truest sense and nothing like you have seen before. And, that’s exactly why we have selected designs like these for the catalog – we want you to be one of a kind and stand out for all the right reasons. You don’t necessarily need heavy duty work or over the top designs to look stylish and party ready. This offbeat cage print blouse with full sleeves and pigeonhole design for the bodice is making this cholian irresistible choice. You can go for a fusion look by pairing this with a traditional lehenga, dupatta, and silver jewelry. Who says you can wear tube tops or strapless designs for western wear only? Don’t listen to whatever you have been told all this while because this blouse design is catching up. From runways to every modern bride’s trousseau, this blouse is making an appearance everywhere. Show off those collar bones, y’all! 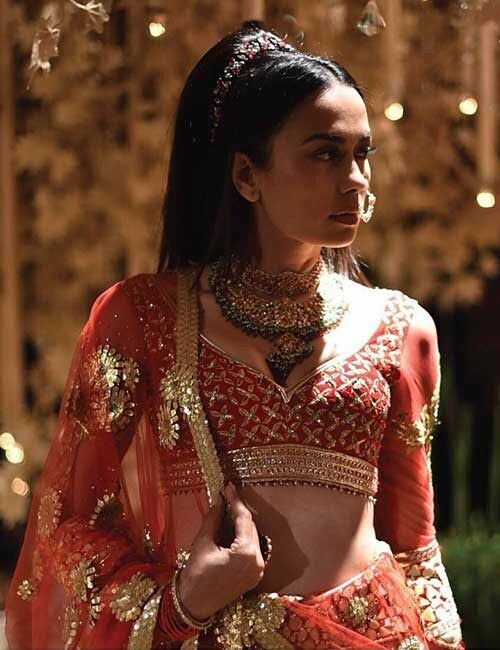 Do you plan to wear your lehenga in a more traditional style and cover up the bodice with the dupatta? Then do it by shifting the focus to the back of your blouse. Gold and red are evergreens, so have no qualms about going all out with this thick golden fish panel embroidery for the back of your blouse. This design looks great on velvet and pure silk blouses. My first impression of this ensemble is that the bride is floating on clouds. Anything I say falls short of how serene it looks. And, to top it all, the high neck sheer bodice with the broad V-neckline is taking it toanother level. The silver panel work and fringe effect for the sleeves is a bonus too. If you are the bride-to-be, don’t miss out on adding this to your list.If you are a friend of the bride, show this to her. 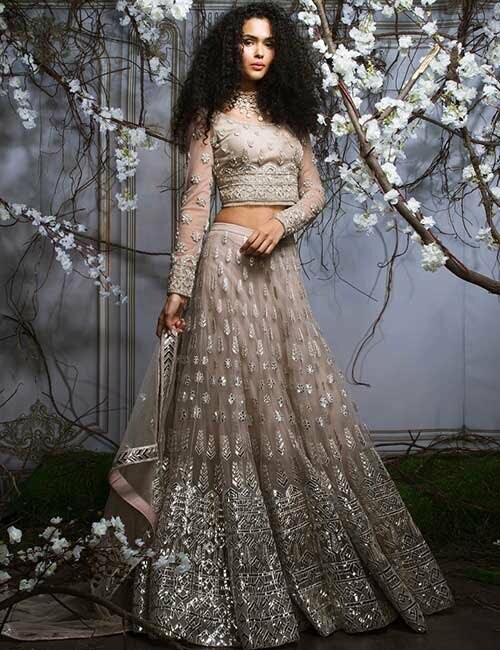 Redefining ebony and ivory with this swoon-worthy lehenga. The high center slit long jacket style blouse that flows onto the threadwork skirt is what dreams are made of. If minimalistic defines you, here’s something that has taken this word quite literally. Keep your skirt and blouse elegant and plain. Let the back take over. 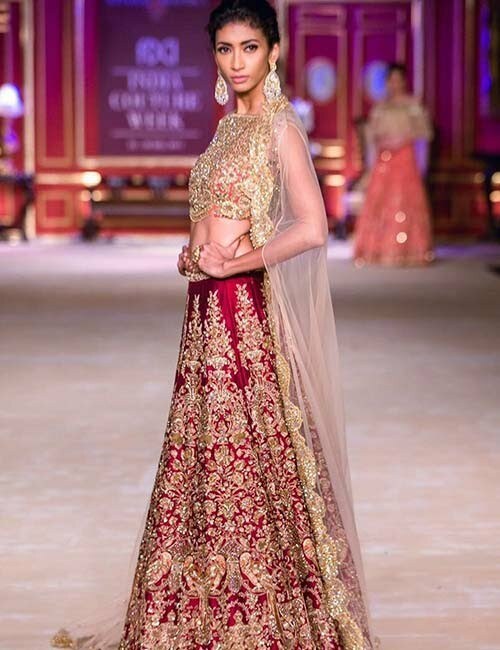 A lehenga from Sabyasachi’s latest bridal collection,which is all things regal. Velvet blouses for sarees and lehengas are making their comeback. The blouse is heavily embroidered with semi-precious stones and pearls.It tells a tale like no other. A traditional age-old chikankari work lehengahas been combined with an off-shoulder style blouse with ruffled sleeves to make it quite an interesting outfit. Perfect for parties.You can choose to either dress up or down with this one. Instead of a gold blouse for your red lehenga, try asilver colored illusion high neck design with heavily studded stonework for the bodice. The lehenga can be simple and mellowed down if you prefer. Saree style blouse is something we are all familiar with, but a little unknown fact is that it is the most commonly used choli for bridal lehengas too. If you like old school styles, then go with this text book definition of a lehengacholi. It will never fail you.